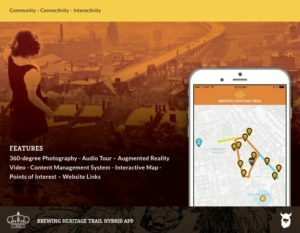 Provided project management, strategy and writing for The Brewery District Community Urban Redevelopment Corporation in support of interactive experiences along the Brewing Heritage Trail. The Interactive Marketing project included 360-degree Photography, Audio Tour, Augmented Reality Video, Content Management System, Interactive Map, Points of Interest and Website. Collaborated with We Have Become Vikings Partners Brandon Hickle and Jason Snell, UX/UI Designer Ryan Cayabyab and Senior Developer Sean C. Davis. WSP | Parsons Brinckerhoff and FRCH Design Worldwide were part of the comprehensive project.